High-speed pulse output: Supports 2-point independent high-speed pulse output (Y0 of up to 50KHz and Y1 of up to 10KHz). *Bandwidth refers to the max. counting range of a single counter. Used for PID temperature/humidity control, 2-axis AC motor drive constant speed control, temperature control using a analog signal monitoring of a whole factory. (PLC EASY LINK). 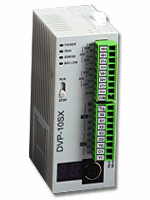 Purchase your Delta DVP-SX Series today!